Our Cambodian truck driver, who says his name is “Mr. T,” pulls the Nissan pickup to the side of the road and looks back at me expressionlessly. “You get out!” he says. As if to underscore this suggestion, he steps out of the truck himself, unzips his jeans and begins to urinate on the side of the road. Since I welcome any chance to exit the jammed mini-cab, I follow suit. I have been riding in Mr. T’s truck long enough to know that he was not being rude with this curt demand. He was merely showing off his arsenal of English phrases, which also includes “I am Mr. T” and “You pay $6.” Every 20 or so minutes, he turns around and says, “This road very bad, ha-ha!” The quip is meant to be a joke, but after two hours of slamming through the unending succession of potholes and washouts known as Cambodia Route 6, I’m not laughing. Since Route 6 is the only passable road from the Thai border to the ancient Khmer monuments at Angkor Wat, it gets a surprisingly steady stream of tourist traffic. We are currently at the height of dry season, and the road is as brown and featureless as the Texas panhandle in winter. Each time a truck full of glassy-eyed travelers bounces past, I feel like I’m journeying through some sadistic antipode to Disneyland, where the only ride lasts six hours and is designed to underscore just how long, difficult and boring life can be. As I void my bladder onto the Route 6 shoulder, I notice that my white-haired seatmate, Mr. Cham, is standing a few paces away, watching me. All dandied-up in a brown porkpie hat and a purple polo shirt, Mr. Cham looks like he’s ready for an afternoon at the horse races. I half expect him to break into applause as I take my whiz. Once I’m finished, he hurries down the road to watch the other foreigner — a middle-aged Belgian named Claude — urinate. I’m beginning to suspect that Mr. Cham doesn’t get out of the house much. Mr. Cham and I have been smashed up against each other in the Nissan mini-cab all morning. For reasons I don’t completely understand, I am sponsoring his ride. The first time I ever saw him was yesterday. He was wearing a black Bon Jovi T-shirt at the time, and had just stolen my sandals. My second encounter with him was this morning, when he showed up at my departure point from a town known as Opasat and informed my Cambodian hosts that I was to pay for his transit to Siem Reap. It seemed like an odd request at the time, but I went ahead and obliged him out of generic courtesy. Mr. Cham has no personality and smells like a bag of stale Cool Ranch Doritos. If I had it to do all over again, I would have saved $3 back at the truck depot and made him ride in the back of the Nissan with the old women, the chickens and the bags of rice. As I return to the truck from my toilet break, Mr. T rushes up to cut me off at the door. At first I think there’s some sort of danger, but it turns out he’s just looking for a chance to show off some more English. “You get in!” he says. In the waning days of the Jimmy Carter administration, when I was about 8 or 9 years old, I dressed up like Batman and, as part of a UNICEF Halloween promotion, went door to door collecting money for the starving children of Cambodia. As I recall, I was far more interested in Batman than Cambodia, and I only mention it now because it occurs to me that Mr. T (who, despite his authoritative name, is no older than me) was probably one of those starving children. Claude the Belgian, who shelled out $10 for the shotgun seat, is gripping the dashboard with a queasy, defeated look. The rest of the passengers, including Mr. Cham and me, are packed into the mini-cab so tightly that there’s no point in trying to steady ourselves. With each road flaw, our heads bang back and forth in unison, like we’ve just been teleported here from a Judas Priest concert. Mr. T slows down only for roadblocks that are manned by men with assault rifles. I have yet to figure out if these armed sentries are soldiers or bandits — or if there is even any distinction between those two job descriptions in northwestern Cambodia. The roadblocks seem to be located only in shaded places where one can hang a hammock, and I suspect that anyone in this country with a spare AK-47 and a little initiative can find part-time work as a freelance Route 6 tollkeeper. Mr. T doesn’t pay the tollkeepers much mind, slowing only to toss a 500-riel note (about $0.13) out the window at each roadblock. When an old codger on a parched section of the highway tries to wave our truck down with a slingshot and a shoddy bundle of sticks, Mr. T slams on the brakes, jumps out of the truck and chases the old man off into the scrub bushes. I’m not exactly sure what nuances lurk behind this confrontation, but it’s the most excitement we’ve had all day. Everyone cheers when Mr. T gets back into the truck. The strangest detail about Cambodia Route 6 is that it is populated by so many children. Some of them are out fixing road defects with shovels; others help guide the trucks over dilapidated bridges. All of these kids demand a tip for their services, but Mr. T unconditionally ignores them. Lots of the kids are armed with Super Soaker water guns — probably a holdover from the Khmer New Year’s festivities — and we get ambushed with water whenever we slow down. 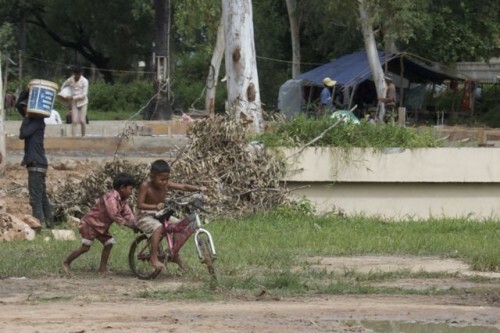 Were I a sentimental ironist, I might make some dewy-eyed observation about how these kids represent the peace-loving hopes of post-Pol Pot Cambodia — how these gentle, harmless water guns have replaced the tools of genocide. Unfortunately, I’m not so optimistic. The old ladies and chickens in the bed of the Nissan are completely soaked because of these spiteful little extortionists, and each time Mr. T drives past without tipping them, they shake their fists at him in pre-adolescent fury. Four hours into our journey, we stop at a village for lunch. “You get out,” Mr. T tells me as we coast to a stop in front of a roadside food stand. I get out. Since I’m not all that hungry, I stand with Claude the Belgian and stretch my legs. I have stopped trying to talk to Claude because he speaks only French and Khmer. What little English he knows is not much better than Mr. T’s repertoire. I try not to hold this against him, since I studied French for two semesters in college, and all I can remember now is that fromage means cheese. As Claude and I stand in silence, a Cambodian man across the street takes an AK-47 out from the cab of his truck and starts to fire it into the sky. He is part of a large crowd, and all the women in his immediate vicinity start to scream. Even from across the road, the noise of the weapon gives me a start. The only thing that keeps me from running for cover is Claude, who acts as if nothing is happening. “What the hell is that all about?” I say under my breath, not really expecting an answer. “Waiting for what?” I reply, still under my breath. As I am watching the quirky wedding festivities across the street, I feel a tug on my shirt. It’s Mr. Cham, who indicates that he wants me to come over to the food stand. For a moment, I think Mr. Cham has redeemed himself by ordering me lunch; as it turns out, he just wants me to pay for his lunch. I foot Cham’s lunch bill, secretly formulating ways to dump this creepy little freeloader as soon as I get to Siem Reap. Since I’m already at the food stand, I decide to check out what kinds of cuisine they offer. The lone on-duty chef at this moment is a scowling 8-year-old girl who chops up a dead chicken with fearsome strokes from a butcher knife. When she finishes, she scoops up the gelatinous cubes of deceased fowl and dumps them onto a plate of rice. I elect to skip lunch. My quest for a toilet leads me to a forlorn strip of cement behind the food stand, which provides a nice view of Route 6 twisting off into the distance. I wish I could say that the midday sun makes the dusty, brown road seem full of intrigue and possibility, but I’m on the wrong continent for that kind of notion. In Cambodia, there are no hipster myths or soda advertisements to insinuate that the road is some kind of romantic-individualist icon. In the Cambodian outback, the road is little more than a long, dully dangerous, frequently uncomfortable way to get to Point B from Point A — a monotonous, head-banging waltz-with-misery that you endure in the hope that it will eventually stop, so you can begin to forget about it. I feel another tug on my shirt. It’s Mr. T, who points back to the Nissan. “You get in!” he says. I get in. But only because there are no other options out here.